Looks like you have entered a product ID (6660) that doesn't exist in the product database. Please check your product ID value again! OTTAWA, Ont. /Troy Media/ – It’s not easy being young these days – especially where employment is concerned. A recent report from Statistics Canada found that full-time employment among young people (aged 17 to 24, excluding full-time students) has declined significantly since the late 1970s. This is not just the result of a bumpy economy. Youth are more likely to be unemployed than the rest of the employable population, regardless of the business cycle. The 15-year span between 1990 and 2015 saw an average youth unemployment rate of almost 12 per cent – well above national averages for adults. And youth under-employment is estimated at 27 to 33 per cent. Media headlines and pundits often decry today’s youth as entitled or lazy, but these stereotypes don’t reflect the realities of employment opportunities. Increasingly, the jobs offered to youth are temporary, contract, unstable and part-time – reflecting a situation found across other Organization for Economic Co-operation and Development (OECD) countries. The federal Liberal government has committed to doing better, promising more jobs and better opportunities for young Canadians. That’s why it launched an Expert Panel on Youth Employment, which will soon issue a final report with suggestions for tackling the issue. So what can be done to tackle the employment obstacles facing Canada’s youth? The good news is that we don’t have to look too far to find successful models for youth skills development and employment – the solution is in our backyard. Too often, government reports and media accounts wax poetic over our fine universities as a source of solutions to our youth employment challenges. But our equally impressive polytechnic institutions get lost in the discussion. Many might be surprised to hear that graduates from schools that are members of Polytechnics Canada enjoyed an employment rate of 86 per cent within six to nine months of graduation (2014-2015). This number rises to 90 per cent for four-year degree programs. Polytechnics are distinct from universities because of their close relationships with industry to design program content, to meet labour market demands, and for their research and development and innovation solutions. Don’t be misled by those who might paint such a discussion as an either-or debate between polytechnics and other post-secondary education. In fact, an increasing number of university students are turning to polytechnics as finishing schools to ease the transition into the labour force. In the 2014-2015 academic year, 14 per cent of full-time polytechnic students had already completed a four-year university bachelor’s degree. Polytechnics help youth, and others, launch careers by prioritizing work-integrated models of learning. Polytechnics also offer academic bridging programs and learning models that are flexible enough to accommodate our most vulnerable youth populations. There are four key ingredients we’d like to see in a federal solution to youth employment. First, the federal government must invest in better labour market information from Statistic Canada. Youth can’t make informed career choices without data on skills in demand, employment outcomes by education type, or the earning power of specific credentials. Let our youth make informed career decisions. Second, new youth employment initiatives should take advantage of the resources at polytechnic and college employment centres. This would leverage public funding that has already been invested over several decades in the core mission of education for employment that is the hallmark of polytechnic education. Third, apprenticeships need a jump-start with secure funding, public awareness and programs to connect apprentices with employers. Canada needs a culture shift that gives apprenticeships the same esteem as other credentials. Those in the skilled trades are truly some of Canada’s best and brightest. The contribution skilled tradespeople make to our economy and their necessity in growing it must be acknowledged. The federal government should promote the new Canada Apprentice Loan – a recent pilot program that gives apprentices support similar to the Canada Student Loans program. Finally, the federal Youth Employment Strategy must be overhauled. A federal work-integrated learning strategy could enable field placements, internships and professional practice. An improved strategy should include career counselling, interview preparation, and the inclusion of part-time and newly graduated students. Employability has always been the polytechnic measure for success. If the government wants to tackle Canada’s youth unemployment problem, looking to how polytechnics offer youth direct pathways to the labour market would be a good place to start. 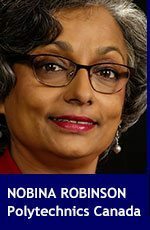 Nobina Robinson is the chief executive officer of Polytechnics Canada, a national alliance of Canada’s leading polytechnics and colleges.